I recently watched a series about great chefs, which inspired me like no other. A product of Netflix, if you’re a true blood follower of food, you might have heard of the Chef’s Table – Documentary Series. The Chef’s Table is nothing like your regular food banter on television, it is for those who search for real depth and meaning in food. It is about a journey, a lifetime of dedication, a struggle and how food found these people. When you find spirituality and respect in cooking and eating food, that’s when you know you’ve found true love. It is this show that has made me realize that I need to give respect to the food I’m cooking as well as that I’m eating. The interesting thing though, is that all these years I have believed that I love food, and it was while watching this show that I realized it was only lust. I never experienced flavours as they were. In India, we often become used to eating plenty of chilli and garlic in our food, often lots of ghee and butter too, without realizing how much is too much. In truth, unless you intend to mask the staleness of meat or a day-old curry, there is no reason to mask the integrity of vegetables or meat with excess garlic. We often eat at run-of-the-mill restaurants that store 3 different colours of base gravies and spike it up with cream and chilli each time they need to dish out an order. Very often we aren’t able to savour the experience, the deep flavor tones of neharis, dal makhanis or sarson ka saag slow cooked over coal all night. What’s worse was that even after having eaten all types of delicious homemade food, we often don’t realize the beauty in subtlety. The meaty flavor that develops with undertones of whole spices in a nehari stock, served for breakfast after a night of patient cooking at home, can never be compared with the onion based green gravy that is often served as “Nalli Nehari” at the restaurant down the road. Cooking is passion, enlightenment and often a spiritual experience. Sometimes you don’t follow tradition, it doesn’t matter what will sell and you don’t compromise on the food you believe in, you simply follow your heart and the result becomes a masterpiece. I have realized in my own pursuits with food, my writing or my videos that there is a marked difference when I go by what I love rather than what people will love, and the result is always better that way. Chef’s Table made me think about the work of great artists and scientists, the work of Da Vinci. What happens when you do what you love? When money is not what you’re after any more than you are after personal satisfaction. Unlike you and me, Leonardo Da Vinci or Einstein or great men that have lived, weren’t after making money to buy a house, but in search of something more, something that made their heart sing. When you follow love like that, day after day, with sincerity and commitment, it doesn’t matter if you rolled out 10000 Burgers a day or not, what matters is that people would travel to eat your food, like Chef Magnus in Episode 6 of Chef’s Table. My favourite though is the romance and poetry in episode 3 of Chef Francis, and the first episode on how the love of his life, helped Chef Massimo Bottura develop his art on a plate. If you want to see the journey of a great Chef, if you want to understand how art looks on a plate or if you want to experience a life translated in food, then you must, must watch this series. It changed my life, my way of cooking and everything that I knew and understood about food, and I’m sure that it will change your life as well. For your viewing pleasure only, here’s a link for the Official Trailer of Chef’s Table on Netflix. And here are some images of food from the show. How This Pasta Sauce Will Become Your Genie-in-a-Bottle? Have you ever seen the spaghetti scene in Eat Pray Love? A woman, jilted in love gives up her job and goes to Italy to simply eat! In a way, I can completely understand the simple classic love affair. In the scene, when she dips her fork into the mountain of spaghetti coated in a rich flavorful sauce that clings on to the strands and paints them into their lovely red, it makes you fall in love, a little bit at a time. I can still picture every bite of spaghetti as Julia Roberts eats it and I can almost taste the spaghetti myself. When you watch that scene, what you need is a genie in a bottle to make tomato-coated spaghetti appear in front of you that very second. A tomato sauce in Italy is slow cooked for 4 to 6 hours, traditionally over fire, to get the correct consistency and flavor. Although we love food nearly the same, none of us have the time, patience or inclination to stand in front of a pot, stirring it and watching it for hours. We believe in instant satisfaction for such cravings, we are used to being provided for and having things done. So it isn’t a surprise that we like our tomato sauce in a bottle too. Here’s the problem, most of the tomato sauces that are on shelves in the Indian market, aren’t really up to the mark. Oftentimes they taste bad, too acidic, too spicy, and too oily, at times it just tastes like off-season bad tasting tomatoes have been masked in excess dried herbs. They are not all bad, you might say. There are some good “imported” tomato sauces for pastas available. Of course, there but I could only afford them if I had diamond shoes and a gold collar for my pony! Pardon my exaggeration but some of these sauces are painfully expensive. I don’t mind investing in authentic Parmesan cheese, but we get good enough tomatoes in India, why should a burn a hole in my pocket for tomato sauce? Luckily, I did find a Pasta Sauce that succeeded in coming somewhat close to my genie-in-a-bottle tomato sauce expectation. 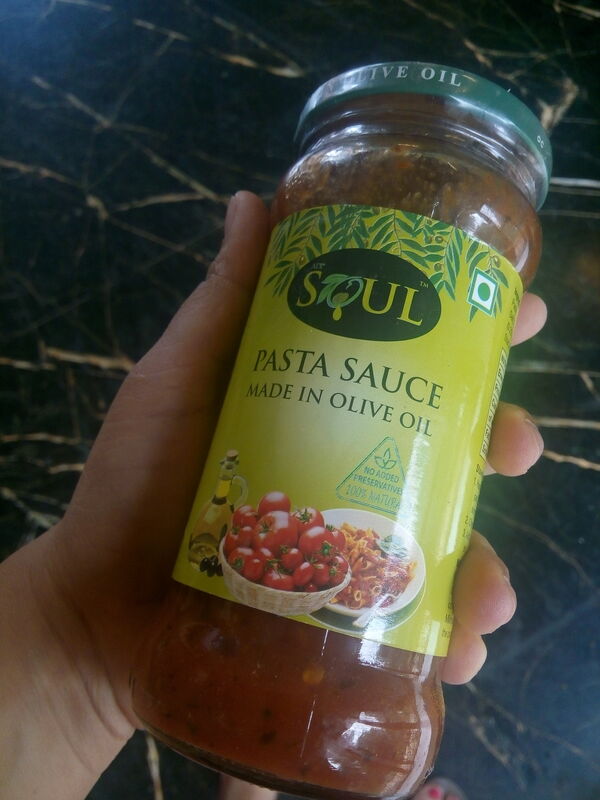 Soul Food (http://bit.ly/bigbasket_soul OR http://bit.ly//greencart_soul ) , yes that same Olive Oil pickle brand, they have also recently introduced a range of other products including a tomato based Pasta sauce. I have enjoyed the flavor of their pickles before, and to be honest they sell a product that preserves Indian flavours and adds the health benefits of Olive Oil to it, something about that thought resonates with my theory of cooking. Aside from the theory, that is, we need to keep things quick and simple in the kitchen. Hoping for a better result, and noticing that my experiment wasn’t going to cost me a bomb, I picked up a bottle of Soul Food Pasta Sauce one day. I tried it out on the same day; at first I only boiled 10 or 12 strands of spaghetti and heated it up the sauce, mixed it up and tried a bite. You see I didn’t want to risk too much spaghetti over it, if this was going to be another disaster [and believe me, I have seen a lot of disastrous spaghettis]. There was no oil floating on top of the bottle, the sauce was not bright red, it looked naturally red. As I nervously took a bite, I was pleasantly surprised with the flavours. Pulpy pieces of cooked tomatoes, some down to mush and some added a fresh texture of slow cooked sauce, there was a mild flavor of dried herbs and seasoning in the sauce. There was no red chilly powder and not too much garlic that would mask the taste of the tomatoes. It was just a rich, thick and well-cooked tomato sauce, very easy to enjoy with some more spaghetti. And this time I emptied the whole packet into the salted boiling water, just one bite of that spaghetti wasn’t going to be enough. When you really love a dish, like I love spaghetti, you tend to try new things and experiment with it. While Spaghetti in tomato sauce with some fresh basil and Parmesan cheese is a classic that no one can beat. I decided this time to give it a break and try something new with simple spaghetti in tomato sauce. I had recently found out that Broccoli makes you beautiful! It is packed with antioxidants and vitamin C. Tomatoes too are packed with ant-oxidants too. So I decided to make a dish that is as soulful as its ingredients are. Roasted Broccoli and toasted almonds go wonderfully well with tomato sauce, what’s more, they add a deeper flavor and crunch to the dish. Almonds are good for you eyes and rich in essential oils, so all in all you are literally becoming more youthful and beautiful as you eat this dish. In a bowl, toss the broccoli pieces and almonds with a drizzle of oil, salt and pepper. Preheat the oven to 300 degree Celsius. 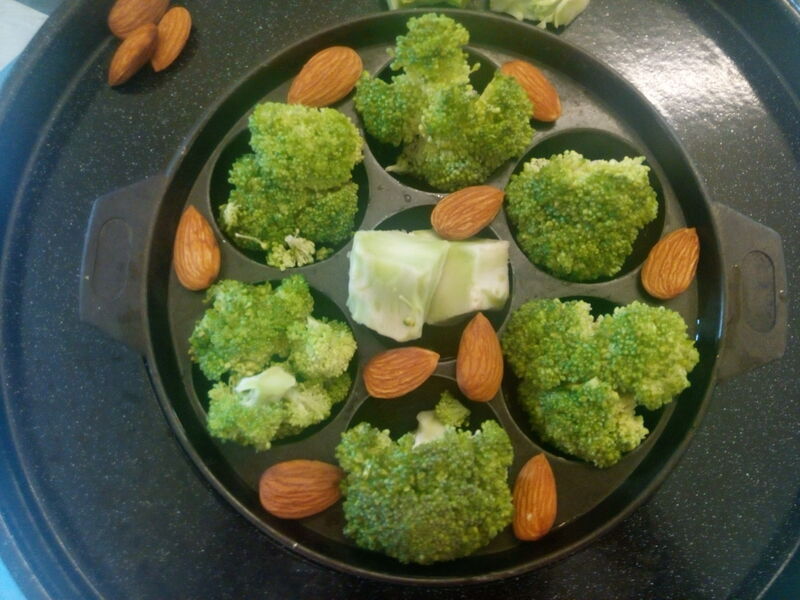 Place the Broccoli and almonds over aluminum foil on an oven tray. Allow them to roasted for 15 minutes. Meanwhile, heat up salted water in a stockpot or pan. 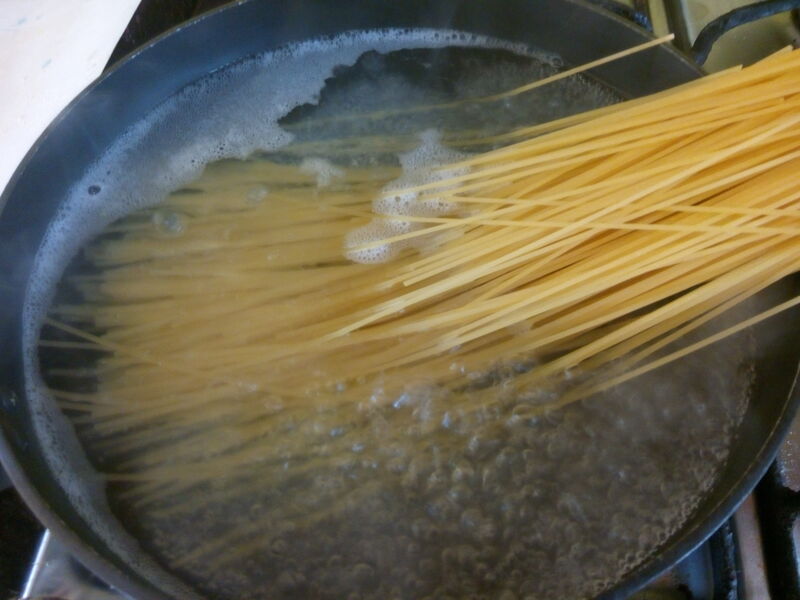 Add the spaghetti to boiling water and allow it to cook for 7 to 10 minutes until it is firm to bite. Drain the spaghetti but save the water. 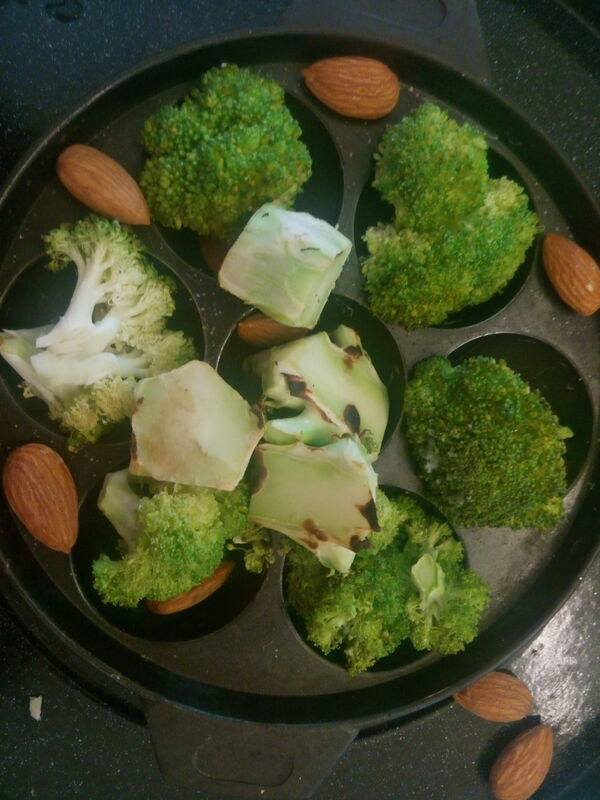 Take the broccoli and almonds out of the oven and allow them to cool on the side. Heat a drizzle of olive oil in a pan, crush and roasted and piece of garlic in it, till you get the smoky flavor. 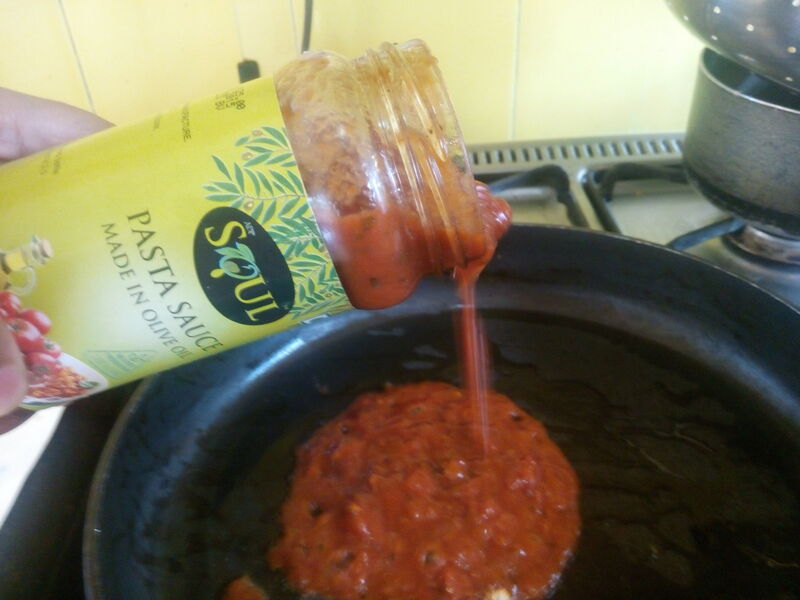 Add in half a bottle of Soul Food Pasta sauce (http://bit.ly/bigbasket_soul OR http://bit.ly//greencart_soul ) to the pan, add 2 spoonful of salted pasta water and allow the sauce to cook for a minute. Add in the cooked spaghetti, broccoli florets and one sliced almond to the spaghetti. Keep it aside. 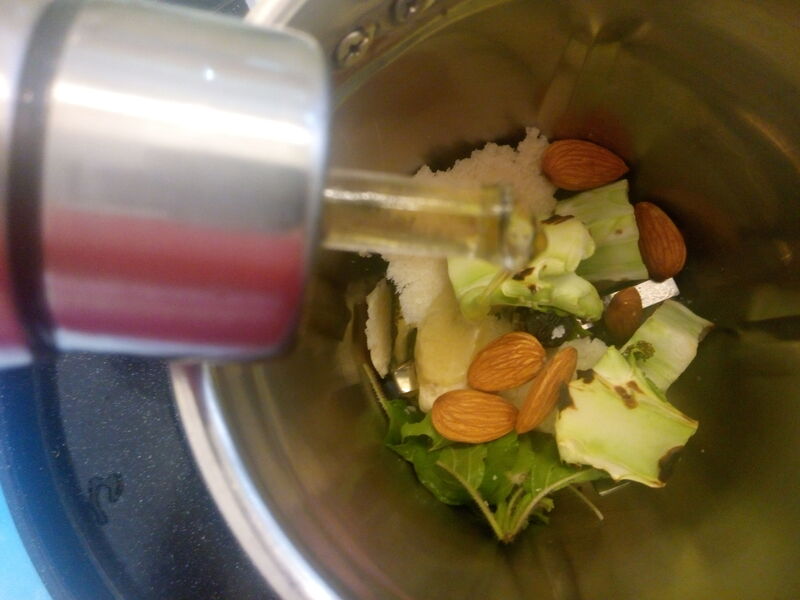 For the Broccoli & Almond Pesto, add broccoli stems, almonds, garlic, basil, parmesan cheese and remaining olive oil to a grinder. Blitz it till the paste is smooth but thick. Blitz some chilled butter with the remaining tomato sauce and keep it aside. To plate, make a thick disc with the broccoli almond pesto on the plate, twirl the spaghetti in tomato sauce over it. Pour the remaining chilled butter with tomato sauce mixture around the spaghetti in an outer red ring. Place a few broccoli florets and sliced almond on top as garnish. Serve! This pasta sauce is low sodium and filled with freshness and goodness of tomatoes, and its herb flavor goes perfectly well with roasted Broccoli. The best part is that the recipe with all the antioxidants and essential oils will give you a glowing skin, a healthy body and keep you young! I hope that you enjoy cooking this recipe as much as I enjoyed eating it. Do try it out and let me know what you thought of this recipe. Buy ADF Soul Products here and here. 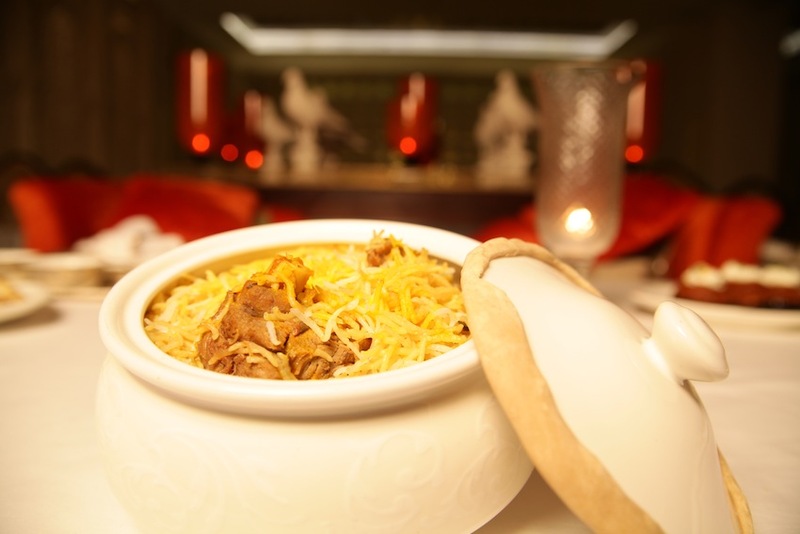 The Dum Pukht Biryani: How to Achieve Spiritual Awakening through Food? It is the most gratifying aroma, and also the most painful craving that comes with the scent of a steaming-hot Dum Biryani. That aroma of basmati rice & robust spices flirting with my nose is divine, so comforting in the midst of a winter evening just setting in. As the waiter sets it onto the next table, I can’t help but look lustfully at the golden yellow grains of long, unbroken basmati rice studded with the large chunks of moist, browned meat. I must look like a hungry tigress I thought, almost ready to jump shamelessly to the next table and attack that gorgeous biryani. But as I saw the proud glare on the face of the woman who was just about to eat it all by herself I quickly turned my head and shied away, as though I had been caught. Although I hadn’t completely ditched the thought of attacking her biryani, I was now stealing a glance or two, pretending like I was searching for the waiter at Dum Pukht. There are few things in the world that can make you feel as good and satisfied as a Dum Pukht Biryani. After all, it is hardly ever that I feel envious and make eyes at another woman’s dinner! It was a sticky situation but as I waited for my own Dum Pukht Biryani I managed to steal a few glances at that rich, regal-looking dish and my heart was pounding, as she was about to slice into that chunk of meat. The moment she touched the meat with her fork, the meat just slipped off the bone. “Ah!” I said, as the lady closed her eyes and enjoyed that first bite of her Dum Pukht biryani. Lovely. As I looked eagerly at her face, searching for an expression of indulgence and gratification, she slowly opened her eyes and looked at me, almost dizzily in love. There it was an instant love-for-food connection, and we both burst into a chuckle. “I’m sorry I can’t share this Biryani”, she said with a funny face. “Neither can I”, I said as my Dum Pukht Biryani arrived at the table. Suddenly, I felt like a five year old child, my eyes twinkling as I was being handed the lollypop. I had been good this year and my reward was finally here. Sometimes in life, it is best to enjoy a meal all by yourself, just drown in the dream, close your eyes, inhale the aromas, slice it softly, chew slowly and just let every sense of your being enjoy that bite of biryani, as if it were your last. That’s what I did. As I slowly worked my way through every bite, each one was a medley of flavours & textures, and each awoke a separate sense of my being, I don’t mock spirituality, but for me this was like enlightenment. This meal, suddenly made me feel alive. I was there, in that moment with every bite that I ate. Call me crazy but I think that food like this is answer to real spiritual awakening, Haaahaa.. In the end, I felt sad that it was over but I was enchanted by the experience, and perhaps addicted to the biryani. As the lady from the next table left, we exchanged a pleasant, “I know how you feel” look. It is amazing how people and how many people connect over food. There was something about this Dum Pukht Biryani that kept making me want to come back. Frankly, I could not afford to come every now and then for this special treat, and certainly could not afford to bring a dozen of my loved ones here to try it out, so I took the other road. The other road being, learning how to make this brilliant, regal-looking Dum Pukht Biryani from the man himself, Chef Mohammed Shareef the Dum Pukht Masterchef at ITC Maratha Mumbai. It was a pleasant evening, we shared a laugh over food talk and he gave me so many little tips about making this biryani right. Apparently, there are some people in the world who still take their art very seriously, and it is not just about the recipe, it is everything from the perfect quality of Basmati rice, cut of meat to the choicest of spices and the order in which they should be added! Here’s the video of the Dum Pukht Biryani recipe for you. This mayonnaise is made with cooked gram flour or besan in place of egg. This is a great recipe substitute for regular mayonnaise, for all those people who don’t eat egg. In a small pan, take 1 tablespoon besan, and add in 2 tablespoons of water and mix well. Cook this mixture over medium heat, and mix thoroughly until the besan is fully cooked. Turn of the heat and mix again. Once the mixture has thickened, pop it into a bowl. To make the mixture smooth, you can also pass it through a sieve. Pop this smooth, lump free mixture back into a bowl. 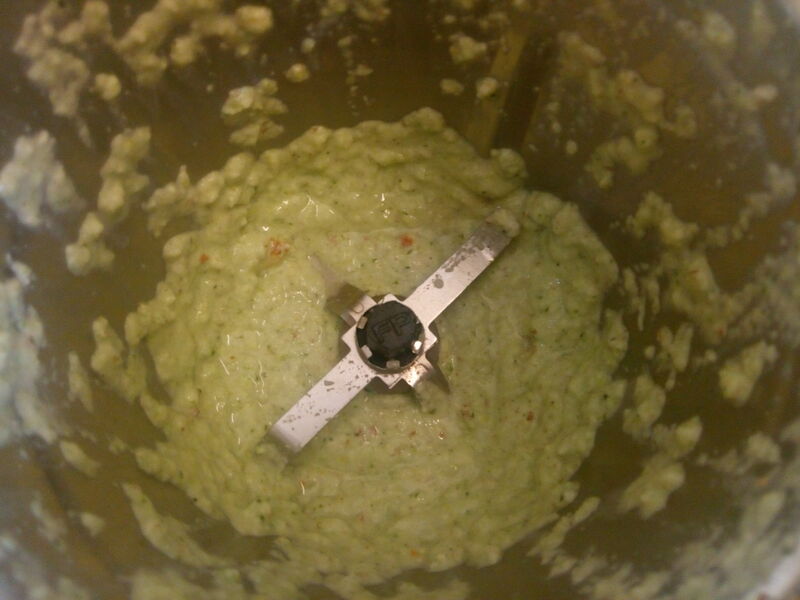 Now, start adding in 1 tablespoon of oil at time and continue mixing vigorously. Don’t add excess oil to the mixture, if you feel that the oil is not getting absorbed, you can stop adding in any more oil. The mixing should be vigorous so that the besan and oil mix together properly. 1 tablespoon of besan mixture will easily incorporate about ¼ cup of oil. You can store this fresh eggless mayonnaise in the refrigerator for a week upto 10 days. Find Video Below on Recipe for Besan (Eggless) Mayonnaise made at Home from scratch.